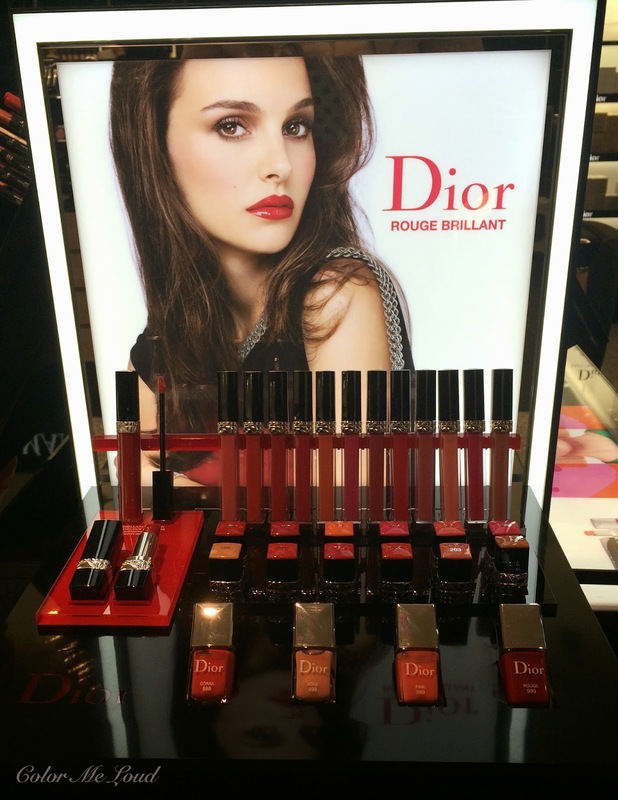 Already last month Dior released their new lip gloss line Dior Rouge Brilliant in the States. These have just landed to Germany and last week I had some opportunity to play with them at the counter. I picked up three of the new nail polishes, which I reviewed and compared here. I also tried some of the glosses there but managed to stay away. I am not a gloss girl and all the glosses I have purchased because they looked so "delicious" (almost like a candy!) in the tube, are all forgotten in the depths of my stash. Here are my first impressions as well as swathes of 12 shades which are released in Germany. I see that in the States 14 shades are available. #028 and #888 Soho are not available here, hence no swatches of those. My quick impressions are that these feel nice on the lips, they are not sticky but you have to be aware that even the deepest shades have a transparency to them I was expecting that more pigmented shades such as Hollywood would be mostly opaque but it was semi-sheer. That shade is so beautiful, too bad that my rather pigmented lips showed through because on the swatch it looked like more opaque. I would categorize Dior Rouge Brilliant between a lip oil and a lip gloss. You can see that Display also has matching lipsticks and surely the promo photo is achieved by layering one of the glosses on a lipstick, I am guessing it is #999 lipstick and gloss together. I don't know if the oils do you a favour if you layer them on another product but on the bright side, it is a multi-use product to apply on its own for lip care or on top of a lipstick to make it look glossier. I tried to categorize the shades so that you can see similar ones together. #760 Times Square is a warm reddish pink. #775 Darling is a deep neutral pink. #766 Rose Harpers is a gorgeous red berry shade. All the four in this set of swatches have very good pigmentation levels and this one is no exception. Another one to consider, lovely! #999 is the classical red shade of Dior. I was a little puzzled that fuchsia was named Hollywood because this shade is the real Marilyn shade to me. I believe this is the one which was used on the promo images. #844 Trafalgar is a medium warm red for those who like orange reds. #310 Paname is a mauve pink which I also tried but since it is very close to my lip color, it didn't nicely show up on me. #468 Bonheur is a light cool pink which is one of the most sheer shades of the line. Hope this was helpful. Check out an in depth review of five of the shades at The Beauty Look Book, Victoire and Darling at Make Up and Beauty Blog and great swatches of six of the shades at Make-up Box. Are you a gloss girl? Does any of these catches your eye? Disclaimer: Thanks to Breuninger Stuttgart for being nice and helpful during the swatches. Thanks so much for the review and swatches! I am a gloss girl, but I like them sticky. I also don't like bold bright glosses. I tend to go for either sheer or pigmented nudes. My favourite formulas are Chanel Glossimer, Nars Lipgloss and Giorgio Armani Lip Lacquer (not so sticky but stays put) and I have tonnes!! I don't like the sound of these Dior ones: firstly, the bright colours look like a smear fest and secondly, something about the concept of a Lip Oil nauseates me (calories!! LOL just kidding). I was at a Dior counter yesterday but they aren't out in the Netherlands yet. Thank you for your review and swatches. My lips are very dry and I am really tempted by several of these , in particular Swan, Miss and Rose Harpers. Would you be able to post a photo of the ingredients list (of any of them, I'm guessing the ingredients won't differ much between shades) if it's not too much trouble? Vielen Dank. yes I ended up not purchasing any. I usually do get at least one to give it a go but these were way too sheer for me, I though would have been waste of money. 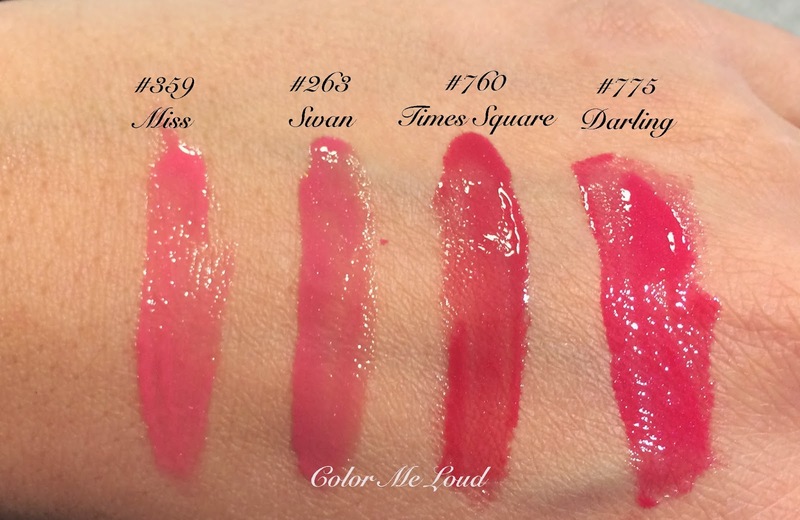 I think there are real lip oils out there, such as one from Clarins, have you checked that one out. I am enjoying one at the moment. It doesn't give any particular color but it is very nourishing. Yay for the gloss girl! You like it sticky? Then stay tuned, I will review two glosses in a few days and they are sticky and last long. I know what you mean about oil on the lips. We are accustomed to remove oil from the lips after we eat, you know it looks like animals hahaha, this sounds so wrong. Calories, hah! I haven't thought about that one but I am sure there are people who do! These are also not out in all the stores in Germany, only a few of them received them. I am guessing will be everywhere i a couple of weeks. We might get different shades here in Asia actually. There are a few that we have, but there are also a few we don't have. I recently bought 888 Soho and it's gorgeous! LOLOL well imagine consuming all that OIL!!! I like my oil with a large helping of fries, at least LOLOL!! Which nail polishes are on that display? I am a gloss girl! 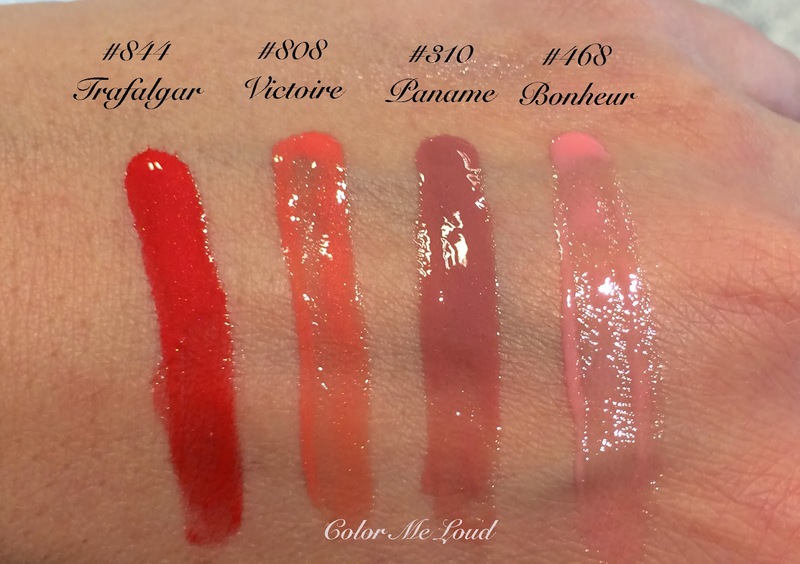 I know what you mean about opacity, but I do like semi sheer glosses (I have a few, never enough ;) from your swatches I'd like to try 999, trafalgar and Victoire. But tI need to see them on the lips ! It's disappointing that they're so sheer. I haven't tried the lip oils from Clarins. Thanks for the suggestion. Thanks for the swatches. Hollywood looks stunning. My second choice would be Miss. Clarins' one is also sheer but I feel it is more nourishing. Soho looks like a wonderful shade, which we had it here. I would certainly be interested to try that one! these are the ones I just reviewed the day before. The fourth one is #999 which is a permanent shade. Hahaha Stacey, you always crack me up! Yes these were the two I considered as well. 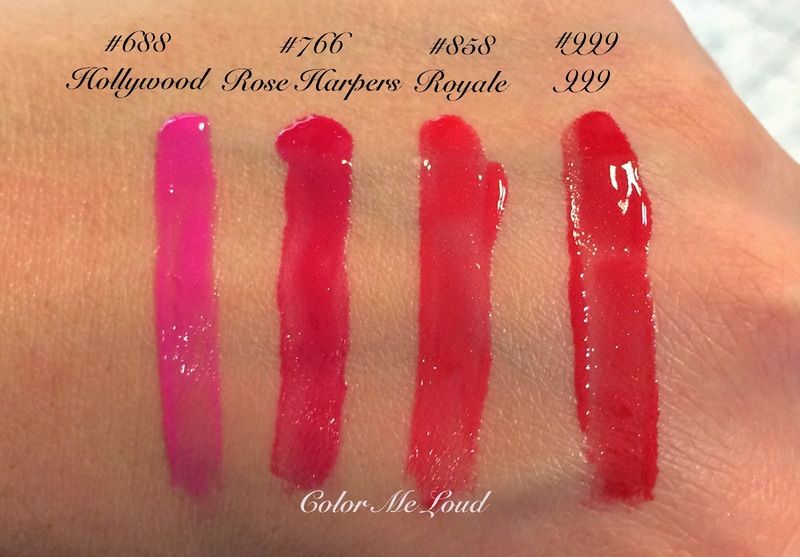 If you like semi-sheer glosses and you like glosses, then you have to check them out. They are really lovely. Victorire looks like a nice warm spring shade. It can be unique indeed. Wow, a couple more, looks like we have another gloss girl right? Hahaha Bella, this cracks me up!